While arthroplasty is the preferred treatment for most elderly patients with displaced femoral neck fractures, internal fixation is the treatment of choice in the majority of patients below the age of 65 as a joint-preserving procedure. The osteosynthesis of fractures of the femoral neck in the elderly has been partly abandoned during the last years due to the poor clinical outcomes following the conventional fixation with parallel screws or DHS. Based on clinical evidence and laboratory testing, the novel method of biplane double-supported screw fixation (BDSF) offers much better fixation stability, reflecting in excellent clinical outcomes. With its innovative biomechanic principle, the BDSF method provides supreme stability for cannulated screw fixation, achieving up to 44% higher axial fixation strength in vitro, and a rate of bone union reaching up to 96.6% in clinical practice, which is much higher than the conventional parallel screw fixation data. The method of BDSF provides supreme stability by buttressing two out of three medially diverging cannulated screws on the inferior femoral neck cortex and supporting the steeper inferior screw on the posterior femoral neck cortex. The two calcar screws are oriented in different coronal inclinations intended to provide constant fixation strength during different patient activities and load directions. Biomechanically, the most effective component is the inferior screw placed at an obtuse angle and supported on a large area along the inferior and posterior cortex of the femoral neck following its spiral anterior curve. Given the clinical outcomes, BDSF is the perfect technique for femoral neck fracture fixation, as the fracture healing rate is high at 96% with this approach. Therefore, BDSF is not only a treatment alternative to conventional fixation, but also a much better procedure. Thus, BDSF should be routinely applied, and conventional fixation gradually abandoned in clinical practice (this has been the approach in our institution over the last ten years). 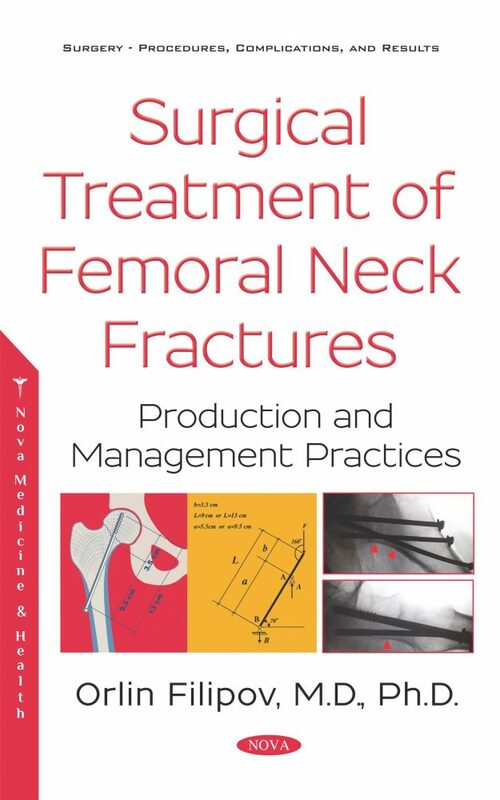 This book describes the full surgical technique of the method of BDSF for femoral neck fracture osteosynthesis; quality criteria and surgical recommendations for successful BDSF implementation, according to the vast clinical experience of ten years with this highly effective method. A novel surgical approach for hip arthroplasty is described in this book. The current trends aimed at decreasing operative trauma and blood loss have been not entirely satisfied with respect to most of the standard approaches for hip arthroplasty. These surgeries are often associated with considerable blood loss and the necessity for restricting patients’ activities in the postoperative period due to impaired joint stability and risk of dislocations. This book describes the full surgical technique of the novel anatomical direct lateral approach for hip arthroplasty, aimed at decreasing blood loss, minimizing operative trauma, and optimizing joint stability. This technique is associated with minimal blood loss and high joint stability. Patients are allowed to perform activities within the normal range of motion in the early postoperative period. This book describes also the history of internal fixation in femoral neck fractures, as well as the biomechanics of femoral neck fracture osteosynthesis and the role of the implants.